The famous Russian icon painter Ushakov created a huge variety of skillful icons. His works are made in the classical church style. The iconographic paintings of Simon Ushakov sparkle with gold and precious stones. The master knew how to choose the right colors to convey the splendor of biblical characters and scenes. 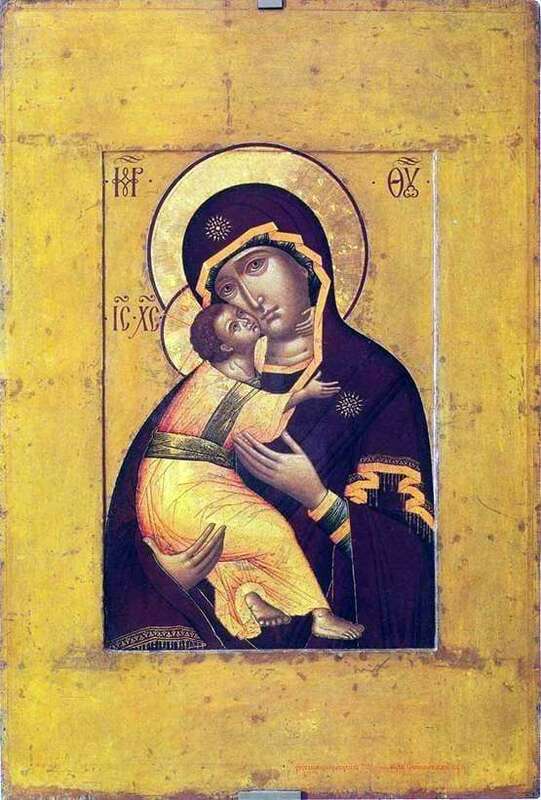 One of his beautiful works is the icon “The Virgin of Vladimir”. The image of Mary with little Jesus is a popular icon-painting plot. The icon of Ushakov of 1652 stands out in a series of similar creations. The painter created a two-sided icon. On its back is the cross of Calvary. The front side is a composition inscribed in a vertical rectangle. The Mother of God embraces the Baby, who in turn also reaches out to her. S. Ushakov used warm golden hues in the picture. The clothes of Mary are dark – saturated brown, decorated with a gold border. Little Christ is dressed in a yellow robe, tied with a bronze belt. The icon is accompanied by traditional graphic inscriptions at the head of the characters. Golden halos are clearly outlined in rounded frames. The composition as a whole is simple, but despite this, it transmits the deep spiritual content of the portrait. The faces of the main biblical characters are full of feelings and experiences. On the face of the mother visible prophetic grief for his son. In the eyes of read love and tenderness to the most native creature. The child in her arms loyally peers into the face of the mother. Despite such a small age, you can see the wisdom and calmness in its features. The icon “Our Lady of Vladimir” was originally located in Zamoskvorechye, in the church of the Archangel Michael. Now you can contemplate it in the Tretyakov Gallery. Gorgeous in design and execution of the picture is clear to all believers. Art connoisseurs far from religion will also appreciate this remarkable work of Ushakov.